Representatives of Solaris Bus & Coach S.A. have just signed a contract for the supply of 54 Urbino 18 CNG buses going to Warsaw. 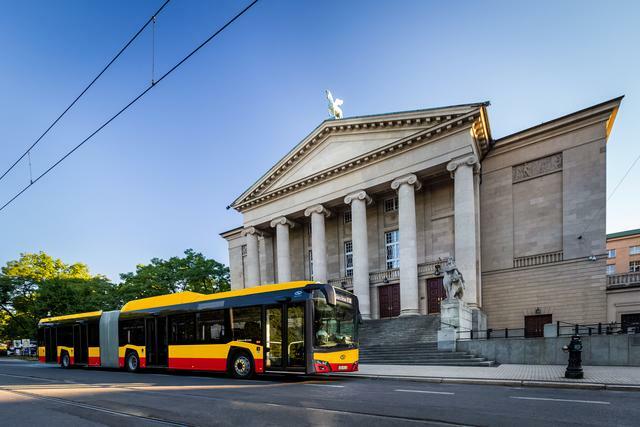 The commission was placed by the company Arriva which will be responsible for the bus service on selected routes, having won a public tender held by the municipal transport company ZTM Warszawa in the preceding year. Even though there are already 1,500 vehicles of the Solaris brand cruising around that city, this will mark the manufacturer’s first time supplying NGVs to the capital of Poland. The articulated Urbino 18 CNG will feature a range of green solutions ensuring a reduction of pollutant emissions into the atmosphere. The buses will be powered by natural gas, stored in roof-mounted tanks boasting a total volume of 1700 liters. The commissioned models will feature Cummins 8.9 engines with a power of 293 kW, meeting the highly restrictive Euro 6 standard. The vehicles will have 39 seats onboard and will be equipped with a comprehensive set of electronic systems, including voice announcement, constant surveillance of the bus interior and exterior, and a passenger counting system and emergency communication for the driver. The noise emission of the Solaris CNG buses will be lower than that of diesel models, which, in combination with an air conditioning system covering the whole vehicle, will significantly increase travel comfort. CNG buses are the most common alternative drive types in use in Poland. According to the authors of the report of the Polish Congress of Alternative Fuels, replacing part of the diesel bus fleet with CNG vehicles can contribute to the reduction of NOx by up to 50%, and of CO2 by up to 20%. Solaris has been producing CNG buses since 2004. So far, over 1,100 NGVs have rolled out of the factory near Poznań, having been dispatched to such countries as Norway, Sweden, Slovenia, the Czech Republic and France.